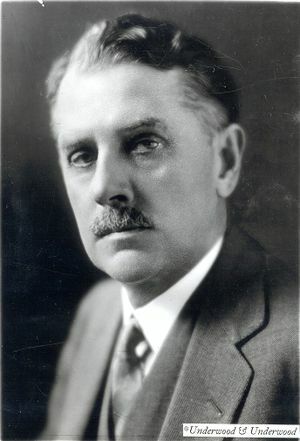 Lewis B. Stillwell, AIEE President, 1909 - 1910, the director of the Niagara Falls Power Company in 1897, and he became the director of the Rapid Transit Subway Company of New York City in 1900. In addition to his work as an engineer and a consultant, Stillwell was also an advocate for energy conservation. Lewis B. Stillwell was born in Scranton, PA, in 1863 into a family that arrived in America during colonial times. He began his studies at Wesleyan and completed a degree in electrical engineering at Lehigh University in 1885. He later received honorary Sc.D. degrees from both institutions. Stillwell joined the engineering staff of the Westinghouse Electric and Manufacturing Company in Pittsburgh, as an assistant electrician. It was at Westinghouse that he and a small group of outstanding young engineers, including Charles F. Scott, Otto Shallenberger, and Benjamin G. Lamme, worked to develop an alternating-current power system. Stillwell became Chief Electrical Engineer at Westinghouse in 1891, and the first hydroelectric generating plant at Niagara Falls was designed and installed under his leadership. The Niagara Falls plant began operation in August 1895, and, in 1897, Stillwell left Westinghouse to become the electrical director of the Niagara Falls Power Company. In 1899, the Manhattan Elevated Railway Company engaged him as a consultant. By 1900, he had left Westinghouse and opened an office in New York City to pursue independent consulting, a project which formed the rest of his career, finally retiring in 1938. His successful engineering practice focused on railroad electrification and electric power transmission, serving a variety of clients including the Manhattan Elevated Railway Company, the New Haven Railroad, and the Port of New York Authority. He also served as director of the Rapid Transit Subway Company in New York City beginning in 1900. Conservation of energy was one of Stillwell's main concerns. In 1914 he spoke on the subject of electricity and conservation of energy at a joint meeting of the American Institute of Electrical Engineers (AIEE) and three other national engineering societies. According to Stillwell, conservation meant "utilization without unnecessary waste" and, more broadly, it meant the development of natural resources, such as water, in such a way as to enhance or increase the resource. For example, he pointed out that renewal of forests produced beneficial effects on stream flow. He suggested that steps should be taken to turn the nation away from "reckless waste ... to a policy of wise conservation, having due regard to the common interest now and in the future." Stillwell urged the professional engineering societies to take an active role, not only in conservation of resources, but also in influencing public opinion "along lines that will result in the enactment of just and wise laws." He continued that the "economic utilization of our natural resources is the fundamental problem of all engineering." He concluded that every engineer ought to strive to prevent mistakes in policy which might result "from actions based upon insufficient and inaccurate knowledge." Stillwell held a number of patents for his inventions, including the Stillwell regulator and a time-limit circuit breaker. Stillwell was quite active in the AIEE, serving on its committee on standardization in 1898 and as the AIEE President for 1909-1910. During his tenure as President, he created a committee to formulate a code of ethics for electrical engineers. In 1933 he received the AIEE Lamme Medal (named for his former colleague at Westinghouse) and, two years later, the Edison Medal "For his distinguished engineering achievements and his pioneer work in the generation, distribution, and utilization of electric energy." He was elected to the National Academy of Sciences in 1921. Stillwell also served as president of the American Society of Consulting Engineers and belonged to a wide variety of other organizations, including: the American Society of Civil Engineers, the British Institution of Electrical Engineers, and the American Philosophical Association. Straphanger History: Lewis B. Stillwell and Alternating Current. Lewis B. Stillwell's Power to Move People. ETHW articles. This page was last edited on 14 February 2019, at 16:14.